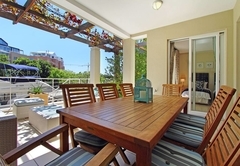 Ellesmere 001 is a property providing self catering in V&A Waterfront for up to 6 guests visiting the Atlantic Seaboard region. 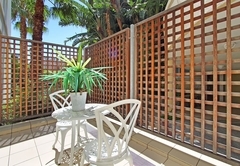 Ellesmere 001 is a three bedroom apartment offering accommodation in Cape Town in the popular V&A Waterfront. 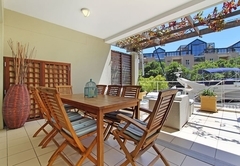 The Waterfront is close to the city and its attractions; including Table Mountain, Lion’s Head, Signal Hill, Kirstenbosch Gardens and the international airport. 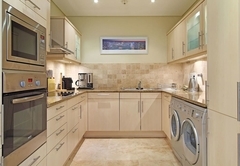 This lovely apartment sleeps six guests in three bedrooms. 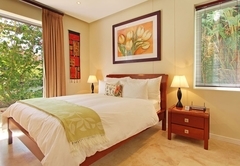 The main bedroom has a queen size bed and an en-suite bathroom. 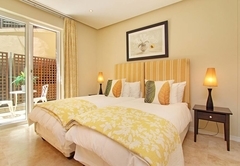 The second bedroom has two single beds and an en-suite bathroom and the third bedroom has two single beds. 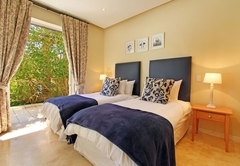 The single beds in the second and third room can easily be converted into a king size bed if required. 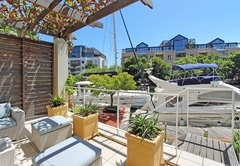 This apartment offers divine urban living right on the marina. 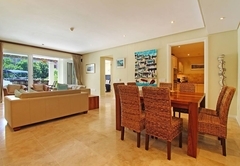 The living area is comfortable and beautifully furnished. The open plan lounge has a TV with DStv and a DVD player. 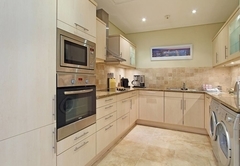 There is a beautiful dining area and off this is the fully equipped kitchen that boasts a washing machine, tumble dryer and a dishwasher. 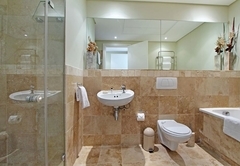 Housekeeping services are available on weekdays on request. 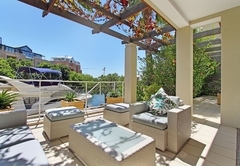 Outside is a lovely balcony with exceptional views of the marina waterways with direct access to the canals. The Victoria & Alfred Waterfront is a keen shopaholic’s delight as it offers a world of fashion, jewellery and accessories (leisure and sports) under one massive roof. 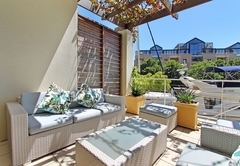 This shopping wonderland is situated in the working harbour of Cape Town, adjacent to the vibrant City Bowl. 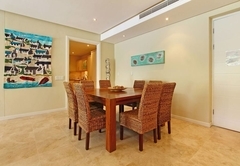 However, it is about more than the fabulous retail outlets, boutiques and speciality stores. The Waterfront is home to an impressive variety of restaurants, bars and even a winery. The entire family is catered for. There are over 60 restaurants at the Waterfront that cater to children, as well as a number of sports bars for those that do not want to miss out. Response timeEllesmere 001 typically responds to requests in 5-10 minutes.